Aimi Hamraie, Ph.D. candidate, Women’s, Gender, and Sexuality Studies, Emory University. Aimi is exploring issues related to universal design and disability. She will be examining several collections, including: the Accessible Snowboard collection, the Van Phillips collection, Safko International papers, and the Hernandez-Rebollar collections. She will also be working with the Smithsonian Accessibility Office to understand how universal design considerations have been built into past exhibitions and the Museum itself. Matthew Hockenberry, Ph.D. candidate, Media, Culture, and Communication, New York University. Matthew is examining the global supply chains used in the manufacturing of telegraph and telephone technologies from approximately 1876–1926. He will examine several collections, including the Western Union papers, the Anglo-American Telegraph Company collections, and the papers of Western Electric founder, Elisha Gray. Hallie Lieberman, Ph.D. candidate, Mass Communication, University of Wisconsin-Madison. Hallie is exploring the technological history of sexual aids. Lieberman will explore familiar collections in new ways—for example, she will examine the trade catalogs of the BF Goodrich rubber companies for information on condoms (vs. tires) and literature from appliance-maker Hamilton Beach for information on vibrators (vs. toasters). She will also examine the Museum’s HIV/AIDS collections and our extensive periodical collections to track the socio-cultural impact of sexual aids. Steven Wilf, professor and associate dean, University of Connecticut Law School. Steven, a legal historian, is conducting research for his forthcoming book with Cambridge University Press, tentatively titled: Intellectual Property Law in America: A Legal and Cultural History. The book traces the history of American intellectual property law from its beginnings in the 18th century through the digital age and describes how patent, copyright, and trademark laws serve to prompt, direct, or even constrain innovation. Wilf will examine runs of invention-oriented periodicals and IP documentation in several of the Museum’s collections, including the Telescoping Shopping Cart Collection; the Eisler Engineering Company Records; the Serge A. Scherbatskoy Papers; the Arthur Ehrat Papers; and the Leo H. Baekeland Papers. 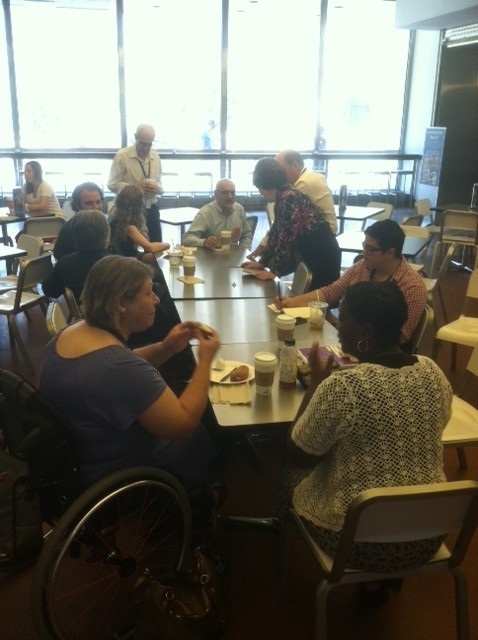 The Lemelson Center fellows and staff talk shop over breakfast. Before signing off, I should tell you that my interest in the Fellows Program extends beyond a simple line item in my job description. You see, to paraphrase an old commercial by the Hair Club for Men, “I’m not only the Fellows Program coordinator, but I’m also a client!” Back in 2007, as a doctoral student at the University of Pennsylvania, I was fortunate to receive a 10-week Lemelson Center Fellowship to conduct research for my dissertation (now book project) on American independent inventors. So I’m very proud to be counted among a distinguished group of alumni fellows and to serve now as the steward of our outstanding Fellows Program.